The trend of not-for-profit organizations purchasing private islands continues to grow, with a new transaction this month on Oregon’s sleepy Willamette River. The state of Oregon is widely known for a few things only; enterprising pioneers following the Oregon Trail when the West was still unknown; and Seattle’s little brother, the cultured and liberal city of Portland. It’s certainly not known for its private islands, however, the large coastal state home to a diverse array of scenic lakes and rivers, including the Willamette, where a 63-acre isle, known as Railroad Island, recently caught the eye of a local conservancy. While the Willamette is dwarfed in sheer size and epic grandeur by the mighty Columbia, it was the smaller river that formed the backbone of Oregon settlement, and all of the state’s major cities – Eugene, Portland, and the state capital of Salem – are found along its shores. It runs along the western edge of the Cascade mountain range that divides Oregon’s eastern plains and grassland from the temperate forests of the Pacific coastline, and it’s easy to see why trail-weary pioneers would have chosen land along the river as their permanent home. Oregon’s pioneering spirit has also led to a deep love of the natural environment, and given rise to many local ecological and conservation groups that strive to protect it. In the case of Railroad Island, it was the McKenzie River Trust that stepped up to acquire the property from its long-time private owners, Wayne and Pam Swago, for an undisclosed amount. The Swagos, both descendants of early 19th century settlers, have a 200-acre farm on the eastern side of the river near the island. The McKenzie River Trust, which owns more than 1,800 acres of West Oregon land, saw the island purchase as an important step in protecting the Willamette River’s wildlife and natural cycles. Located downstream from Green Island, also being conserved by the group, Railroad Island provides refuge for Chinook salmon and other fish, along with being a nesting site for migratory birds. 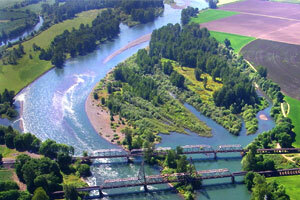 Maintenance of the floodplain island is also essential to protect the river’s banks from dangerous erosion.